E-1. Snakes are widely distributed. They are found in all tropical, subtropical, and most temperate regions. 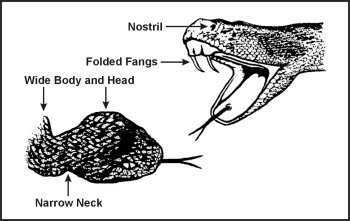 Some species of snakes have specialized glands that contain a toxic venom, and long, hollow fangs to inject their venom. E-2. Although venomous snakes use their venom to secure food, they also use it for self-defense. Human accidents occur when you don't see or hear the snake, when you step on them, or when you walk too close to them. E-4. Snakes dangerous to man usually fall into two groups: proteroglypha and solenoglypha. Their fangs and their venom best describe these two groups (Figure E-1). E-5. The proteroglypha have, in front of the upper jaw and preceding the ordinary teeth, permanently erect fangs. These fangs are called fixed fangs. E-6. The solenoglypha have erectile fangs; that is, fangs they can raise to an erect position. These fangs are called folded fangs. E-7. 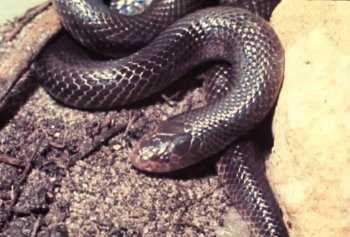 The fixed-fang snakes (proteroglypha) usually have neurotoxic venoms. These venoms affect the nervous system, making the victim unable to breathe. E-8. 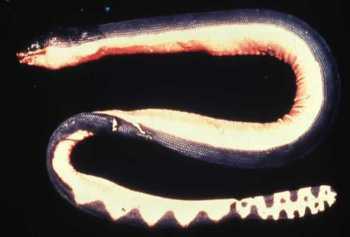 The folded-fang snakes (solenoglypha) usually have hemotoxic venoms. These venoms affect the circulatory system, destroying blood cells, damaging skin tissues, and causing internal hemorrhaging. E-9. Remember, however, that most venomous snakes have both neurotoxic and hemotoxic venom. 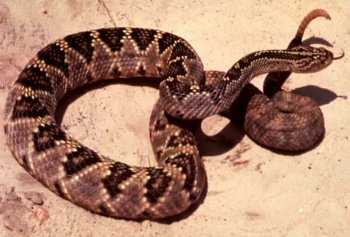 Usually one type of venom in the snake is dominant and the other is weak. E-10. No single characteristic distinguishes a venomous snake from a harmless one except the presence of poison fangs and glands. Only in dead specimens can you determine the presence of these fangs and glands without danger. Learn about the two groups of snakes and the families in which they fall (Figures E-2). E-12. 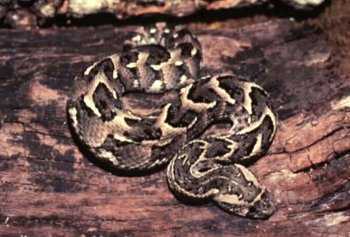 The viperidae, or true vipers, usually have thick bodies and heads that are much wider than their necks (Figure E-4). However, there are many different sizes, markings, and colorations. E-13. This snake group has developed a highly sophisticated means for delivering venom. They have long, hollow fangs that perform like hypodermic needles. They deliver their venom deep into the wound. E-14. The fangs of this group of snakes are movable. 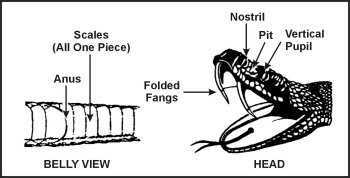 These snakes fold their fangs into the roof of their mouths. When they strike, their fangs come forward, stabbing the victim. 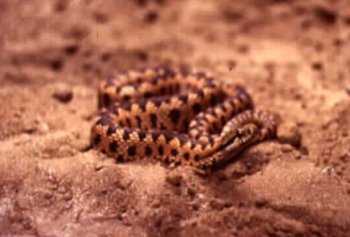 The snake controls the movement of its fangs; fang movement is not automatic. The venom is usually hemotoxic. However, there are several species that have large quantities of neurotoxic elements, thus making them even more dangerous. 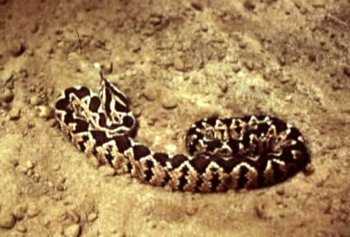 The vipers are responsible for many human fatalities around the world. E-15. 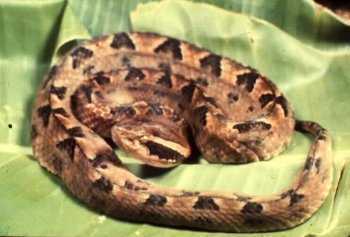 The crotalids, or pit vipers (Figure E-5), may be either slender or thick-bodied. Their heads are usually much wider than their necks. These snakes take their name from the deep pit located between the eye and the nostril. They are usually brown with dark blotches but some kinds are green. E-16. 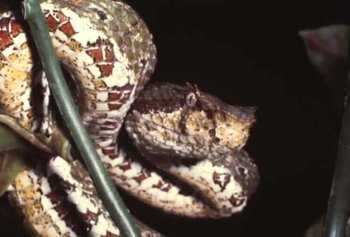 Rattlesnakes, copperheads, cottonmouths, and several species of dangerous snakes from Central and South America, Asia, China, and India fall into the pit viper group. The pit is a highly sensitive organ capable of picking up the slightest temperature variance. 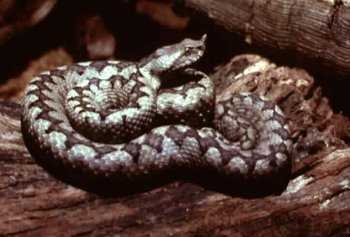 Most pit vipers are nocturnal. They hunt for food at night with the aid of these specialized pits that let them locate prey in total darkness. 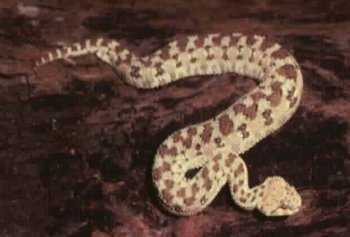 Rattlesnakes are the only pit vipers that possess a rattle at the tip of the tail. E-17. 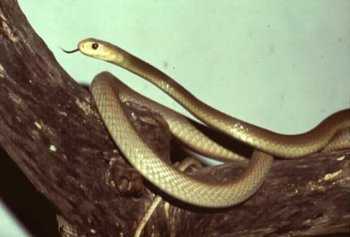 India has about twelve species of these snakes. You find them in trees or on the ground in all types of terrain. 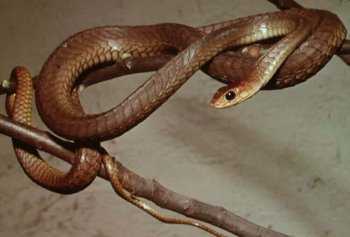 The tree snakes are slender; the ground snakes are heavy-bodied. All are dangerous. (5 feet) but is not vicious unless irritated. You can also find a small pit viper, about 45 centimeters (18 inches) long, on the plains of eastern China. It is too small to be dangerous to a man wearing shoes. E-19. 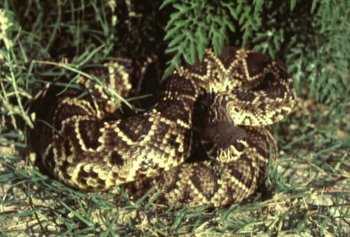 There are about twenty-seven species of rattlesnakes in the United States and Mexico. They vary in color and may or may not have spots or blotches. 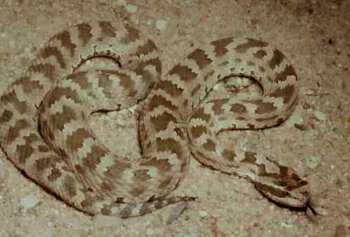 Some are small but others, such as the diamondbacks, may grow to 2.5 meters (8 feet) long. E-20. 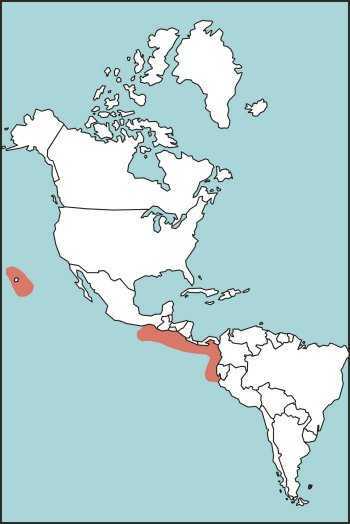 There are five kinds of rattlesnakes in Central and South America, but only the tropical rattlesnake is widely distributed. 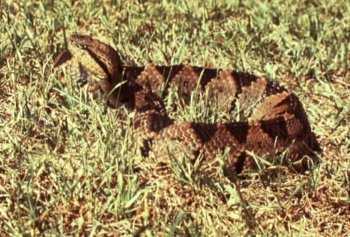 The rattle on the tip of the tail is sufficient identification for a rattlesnake. E-21. Most will try to escape without a fight when approached, but there is always a chance one will strike at a passerby. They do not always give a warning; they may strike first and rattle afterwards or not at all. E-22. 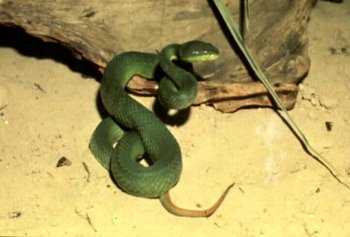 The genus Trimeresurus is a subgroup of the crotalidae. These are Asian pit vipers. 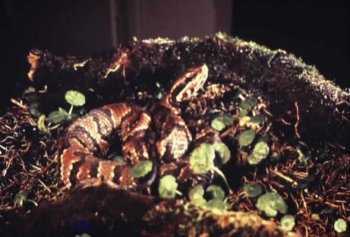 They are normally tree-loving snakes, but some live on the ground. They basically have the same characteristics of the crotalidae—slender build and very dangerous. Their bites usually are on the upper extremities—head, neck, and shoulders. Their venom is largely hemotoxic. E-23. Elapidae are a group of highly dangerous snakes with a powerful neurotoxic venom that affects the nervous system, causing respiratory paralysis. 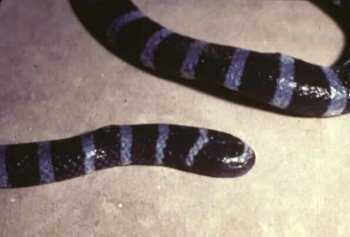 Included in this family are coral snakes, cobras, mambas, and all the Australian venomous snakes. The coral snake is small and has caused human fatalities. 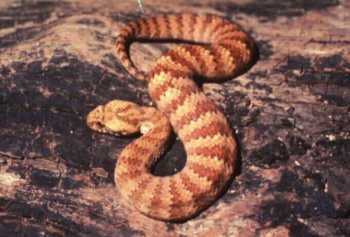 The Australian death adder, tiger, taipan, and king brown snakes are among the most venomous in the world, causing many human fatalities. E-24. Only by examining a dead snake can you positively determine if it is a cobra or a near relative (Figure E-6). 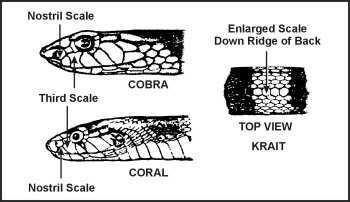 On cobras, kraits, and coral snakes, the third scale on the upper lip touches both the nostril scale and the eye. The krait also has a row of enlarged scales down its ridged back. E-25. You can find the cobras of Africa and the Near East in almost any habitat. One kind may live in or near water, another in trees. Some are aggressive and savage. 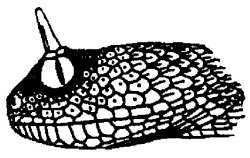 The distance a cobra can strike in a forward direction is equal to the distance its head is raised above the ground. Some cobras, however, can spit venom a distance of 3 to 3.5 meters (10 to 12 feet). This venom is harmless unless it gets into your eyes; then it may cause blindness if not washed out immediately. Poking around in holes and rock piles is dangerous because of the chance of encountering a spitting cobra. E-26. 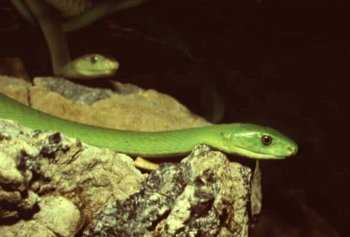 A subfamily of elapidae, these snakes are specialized in that they found a better environment in the oceans. Why they are in the oceans is not clear to scientists. 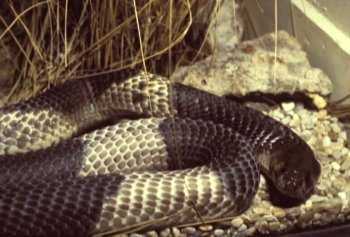 nakes have venom several times more toxic than the cobra's. Because of their marine environment, sea snakes seldom come in contact with humans. The exceptions are fisherman who capture these dangerous snakes in fishnets and scuba divers who swim in waters where sea snakes are found. E-28. There are many species of sea snakes. They vary greatly in color and shape. 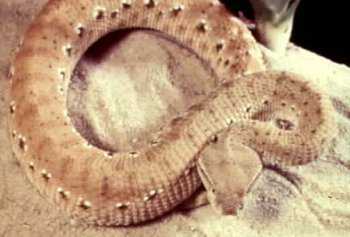 Their scales distinguish them from eels that have no scales. 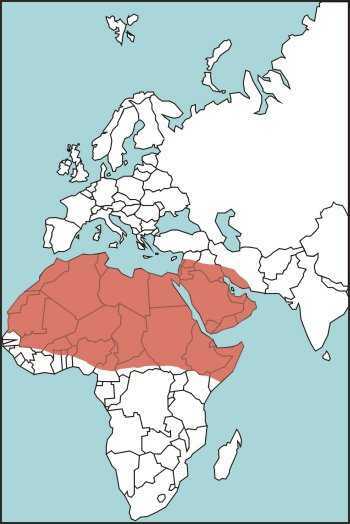 Africa and in the Persian Gulf. There are no sea snakes in the Atlantic Ocean. E-30. There is no need to fear sea snakes. They have not been known to attack a man swimming. Fishermen occasionally get bitten by a sea snake caught in a net. The bite is dangerous. E-31. 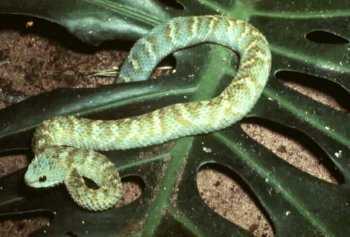 The colubridae is the largest group of snakes worldwide. In this family there are species that are rear-fanged; however, most are completely harmless to man. They have a venom-producing gland and enlarged, grooved rear fangs that allow venom to flow into the wound. The inefficient venom apparatus and the specialized venom is effective on cold-blooded animals (such as frogs and lizards) but not considered a threat to human life. 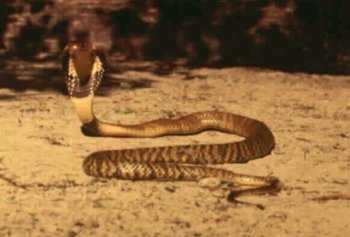 However, the boomslang and the twig snake of Africa have caused human deaths. E-32. There is little to fear from lizards as long as you follow the same precautions as for avoiding snakebite. 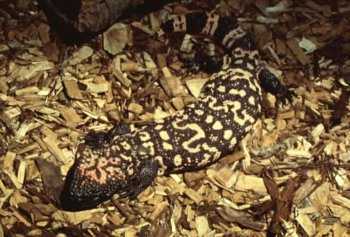 There are only two poisonous lizards: the Gila monster and the Mexican beaded lizard. The venom of both these lizards is neurotoxic. 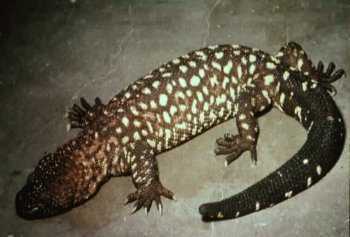 The two lizards are in the same family, and both are slow moving with a docile nature. E-33. The komodo dragon (Varanus komodoensis), although not poisonous, can be dangerous due to its large size. These lizards can reach lengths of 3 meters (10 feet) and weigh over 115 kilograms (253 pounds). Do not try to capture this lizard. Length: Average 60 centimeters (24 inches), maximum (47 inches) 120 centimeters. Distribution: Texas, Oklahoma, Illinois, Kansas, Ohio, most of the southeast United States, and along the Atlantic coast from north Florida to Massachusetts (Figure E-7). Characteristics: The world's largest pit viper has a bad reputation. 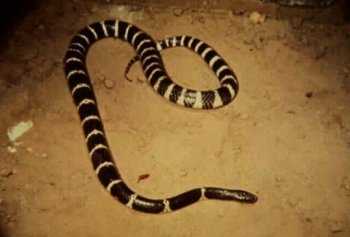 This huge venomous snake is not common anywhere in its range. It lives in remote and isolated habitats and is largely nocturnal in its feeding habits. It seldom bites anyone, so few bites are recorded. A bite from one would indeed be very serious and fatal if medical aid was not immediately available. Usually, the bites occur in remote, dense jungles, many kilometers and several hours or even days away from medical help. Bushmaster fangs are long. In large bushmasters, they can measure 3.8 centimeters (1 3/4 inches). Its venom is a powerful hemotoxin. 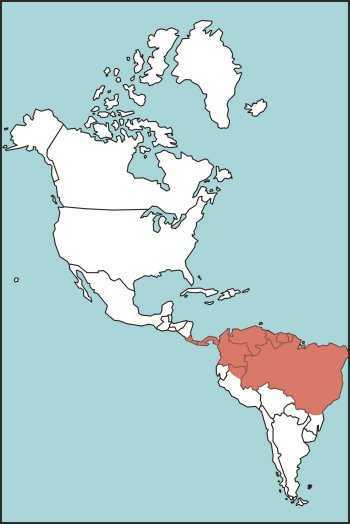 Distribution: Northern South America and parts of Central America, including Nicaragua, Costa Rica, Panama, Trinidad, and Brazil (Figure E-8). Length: Average 60 centimeters (24 inches), maximum 115 centimeters (45 inches). Distribution: Southeast United States and west to Texas. 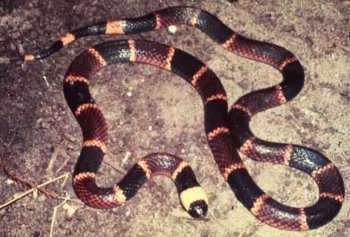 Another genus of coral snake is found in Arizona. 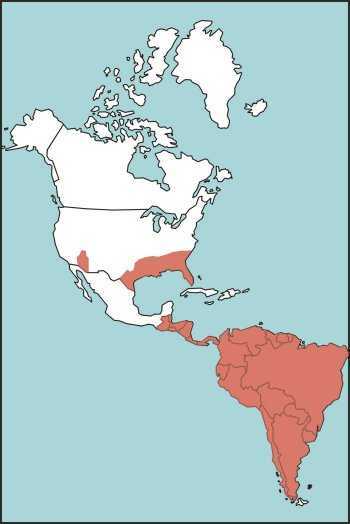 Coral snakes are also found throughout Central and most of South America (Figure E-9). Characteristics: These dangerous semiaquatic snakes closely resemble harmless water snakes that have the same habitat. Therefore, it is best to leave all water snakes alone. Cottonmouths often stand their ground. 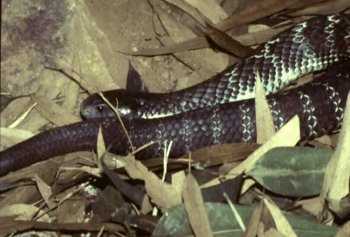 An aroused cottonmouth will draw its head close to its body and open its mouth, showing its white interior. 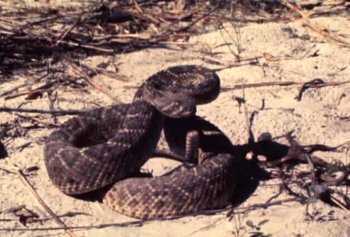 Cottonmouth venom is hemotoxic and potent. Bites are prone to gangrene. Length: Average 90 centimeters (35 inches), maximum 1.8 meters (6 feet). Distribution: Most of southeast United States, particularly southeast Virginia, west central Alabama, south Georgia, Illinois, east central Kentucky, south central Oklahoma, Texas, North and South Carolina, and Florida (including the Florida Keys) (Figure E-10). 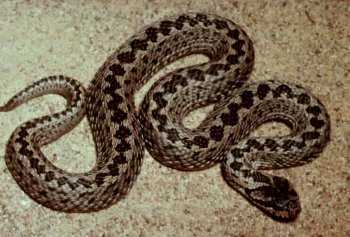 Description: Dark brown or black, outlined by a row of cream or yellowish scales. Ground color is olive to brown. Characteristics: The largest venomous snake in the United States. Large snakes can have fangs that measure 2.5 centimeters (1 inch) in a straight line. This species has a sullen disposition, ready to defend itself when threatened. 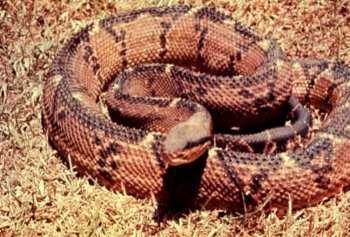 Its venom is potent and hemotoxic, causing great pain and damage to tissue. Length: Average 1.4 meters (5 feet), maximum 2.4 meters (8 feet). Distribution: Coastal areas of North Carolina, South Carolina, Louisiana, and Florida (including the Florida Keys) (Figure E-11). Length: Average 45 centimeters (18 inches), maximum 75 centimeters (30 inches). 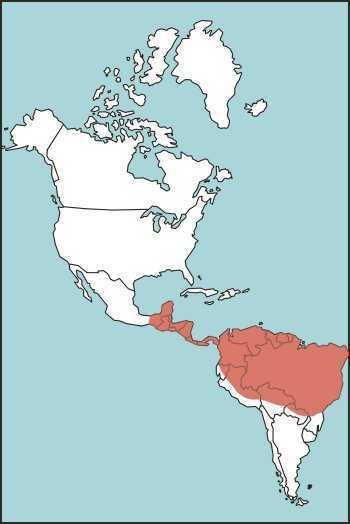 Distribution: Southern Mexico, throughout Central America, Columbia, Ecuador, and Venezuela (Figure E-12). 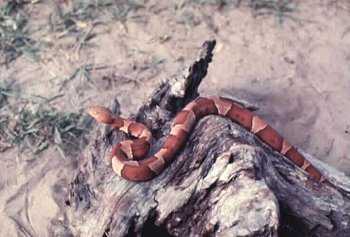 Characteristics: This highly dangerous snake is responsible for a high mortality rate. It has an irritable disposition, ready to strike with little provocation. 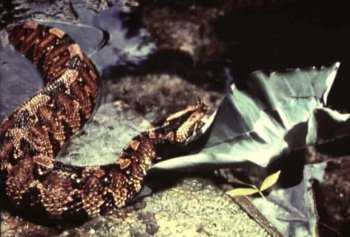 The female fer-de-lance is highly prolific, producing up to 60 young, all with a dangerous bite. The venom of this species is hemotoxic, painful, and hemorrhagic (causing profuse internal bleeding). The venom causes massive tissue destruction. 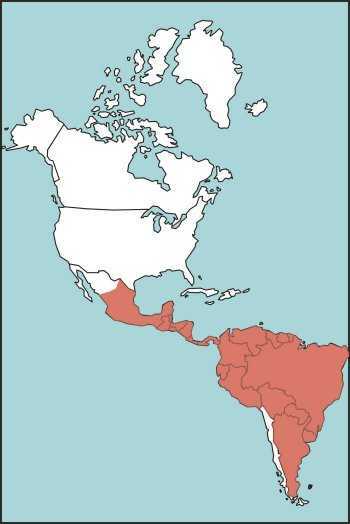 Distribution: Southern Mexico, throughout Central and South America (Figure E-13). Length: Average 60 centimeters (24 inches), maximum 120 centimeters (48 inches). 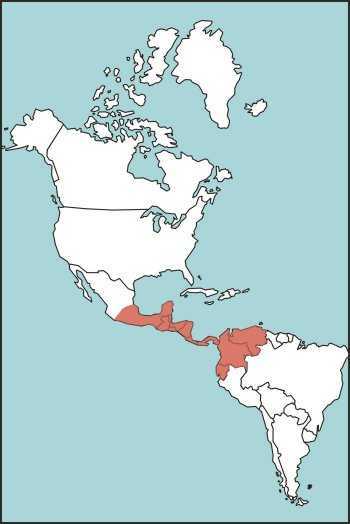 Distribution: Southern Mexico, Honduras, Guatemala, Costa Rica, Panama, and El Salvador (Figure E-14). 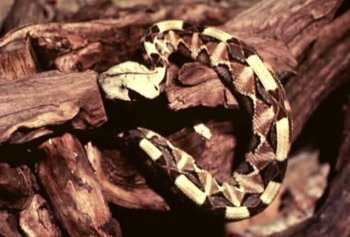 Description: This snake's entire body is a pallid or sandy color with darker diamond-shaped markings bordered by lighter-colored scales and black bands around the tail. Habitat: Found in arid regions, deserts, and rocky hillsides from sea level to 2400-meter (7920-feet) elevations. Length: Average 75 centimeters (29 inches), maximum 1.2 meters (4 feet). 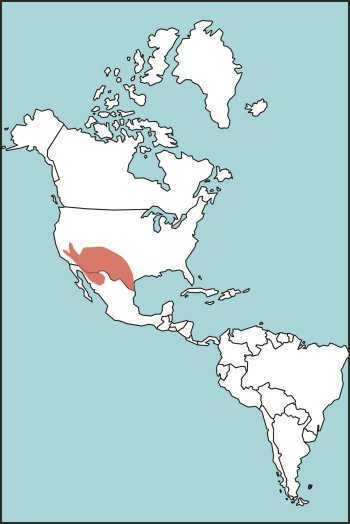 Distribution: Southwest United States, particularly in the Mojave Desert in California, Nevada, southwest Arizona, and Texas into Mexico (Figure E-15). Length: Average 1.4 meters (5 feet), maximum 2.1 meters (7 feet). 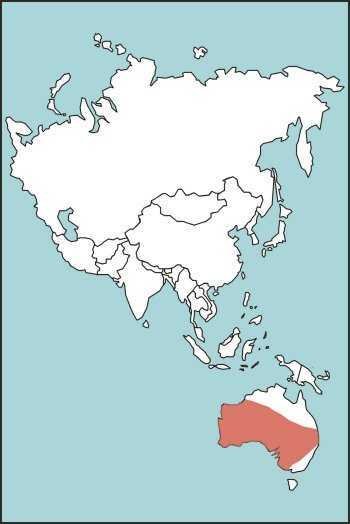 Distribution: Southern Mexico, Central America, and all of South America except Chile (Figure E-16). Length: Average 1.5 meters (5 feet), maximum 2 meters (7 feet). 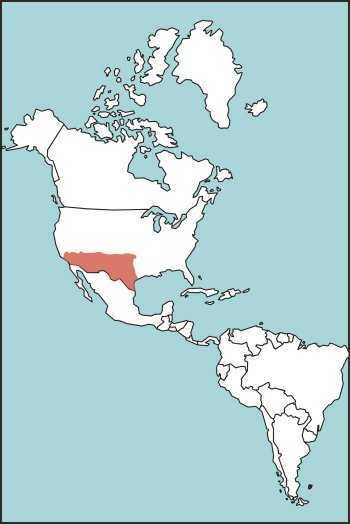 Distribution: Southwest United States, particularly southeast California, Oklahoma, Texas, New Mexico, and Arizona (Figure E-17). Distribution: Very common throughout most of Europe; northern Morocco (Figure E-18). Distribution: Italy, Yugoslavia, northern Albania, and Romania (Figure E-19). 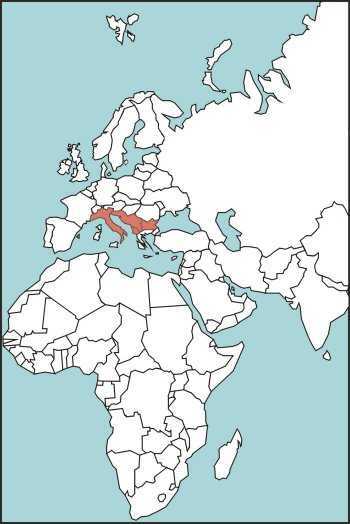 Distribution: Throughout southeastern Europe (Figure E-20). 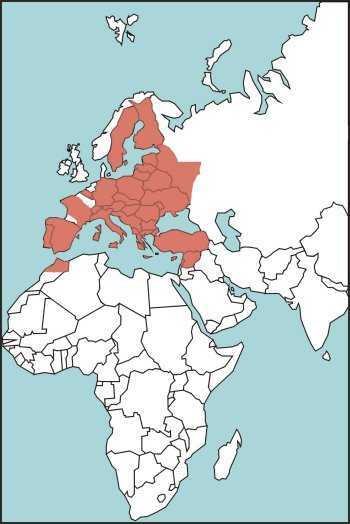 Distribution: Most of Europe, particularly Greece, Germany, Yugoslavia, France, Italy, Hungary, Romania, Bulgaria, and Albania; northern Morocco (Figure E-21). Length: Generally less than 60 centimeters (24 inches). 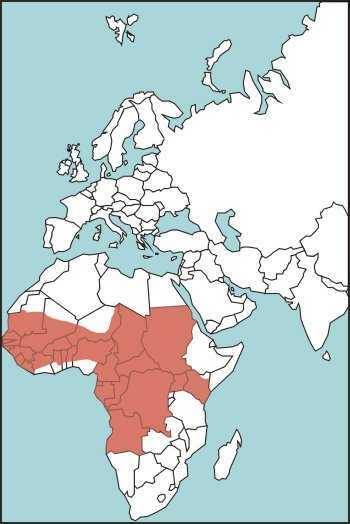 Distribution: Found throughout sub-Saharan Africa (Figure E-22). 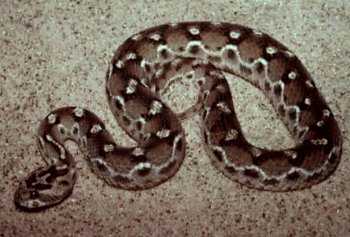 Description: Often called leaf viper, its color varies from ground colors of pale green to olive, brown, or rusty brown. The viper uses its prehensile tail to secure itself to branches. Characteristics: An arboreal species that often comes down to the ground to feed on small rodents. It is not aggressive, but it will defend itself when molested or touched. Its venom is hemotoxic; healthy adults rarely die from its bite. Length: Average 45 centimeters (18 inches), maximum 75 centimeters (29 inches). 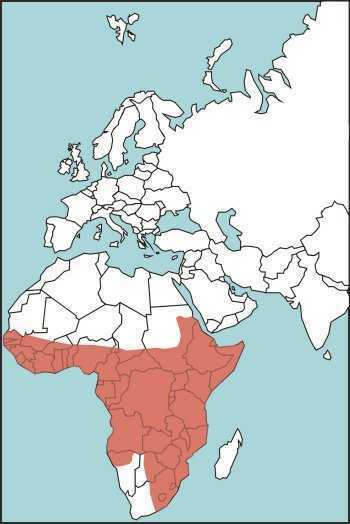 Distribution: Most of Africa, particularly Angola, Cameroon, Uganda, Kenya, and the Congo (Figure E-23). Description: Usually slate gray to brown overall. The back of the hood may or may not have a pattern. Habitat: Found in any habitat: cultivated farms, swamps, open fields, and human dwellings, where it searches for rodents. Length: Average 1.2 meters (4 feet), maximum 2.1 meters (7 feet). 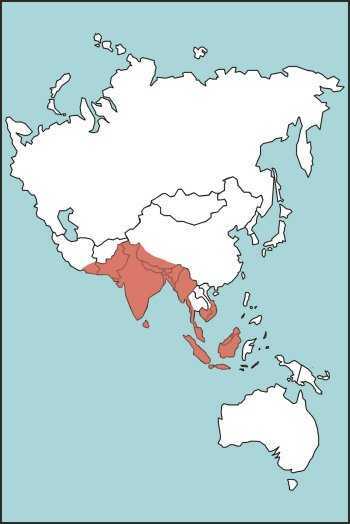 Distribution: From southeast to southwest Asia, including Indonesia (Figure E-24). Length: Average 1.5 meters (5 feet), maximum 2.5 meters (8 feet). 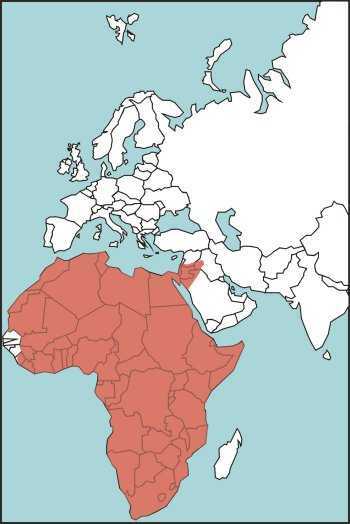 Distribution: Africa, Iraq, Syria, and Saudi Arabia (Figure E-25). 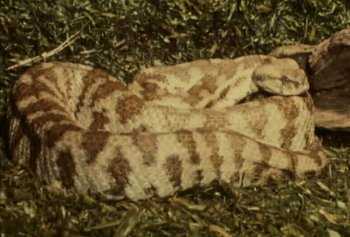 Description: Pink to brown with a vertebral series of elongated yellowish or light brown spots connected by hourglass-shaped markings on each side. It has a dark brown stripe behind each eye. This dangerous viper is almost invisible on the forest floor. 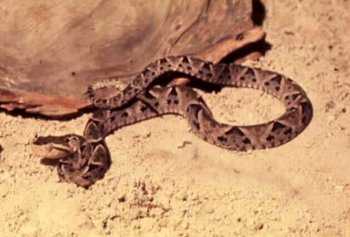 A 1.8-meter-long (6-foot-long) Gaboon viper could weigh 16 kilograms (35 pounds). 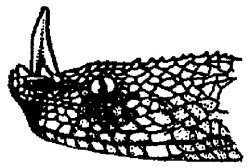 Characteristics: The largest and heaviest of all true vipers, having a very large triangular head. It comes out in the evening to feed. Fortunately, it is not aggressive, but it will stand its ground if approached. It bites when molested or stepped on. Its fangs are enormous, often measuring 5 centimeters (2 inches) long. It injects a large amount of venom when it strikes. Its venom is neurotoxic and hemotoxic. 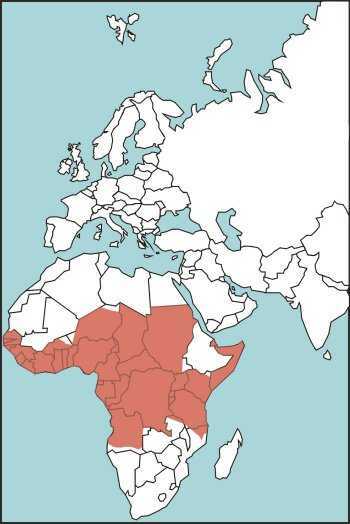 Distribution: Most of Africa (Figure E-26). Characteristics: The mamba is the most dreaded snake species of Africa. Treat it with great respect. It is considered one of the most dangerous snakes known. Not only is it highly venomous but it is aggressive and its victim has little chance to escape from a bite. Its venom is highly neurotoxic. 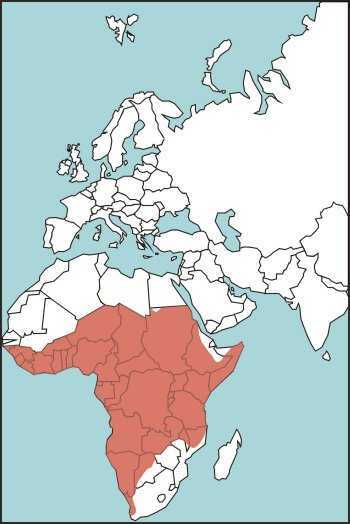 Distribution: Most of Africa (Figure E-27). Distribution: Much of south and southeast Asia, particularly India, Myanmar, Malaya, Thailand, Laos, Cambodia, Vietnam, China, Indonesia, and Taiwan (Figure E-28). 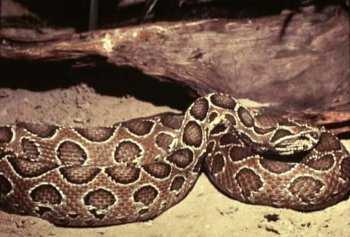 Characteristics: This snake is responsible for biting many humans, and its bite could be fatal. It is an irritable species ready to defend itself. Its venom is hemotoxic, causing pain and considerable tissue damage. Habitat: Found in a variety of habitats, ranging from lowlands to mountainous regions. Often encountered in old houses and rock walls surrounding buildings. 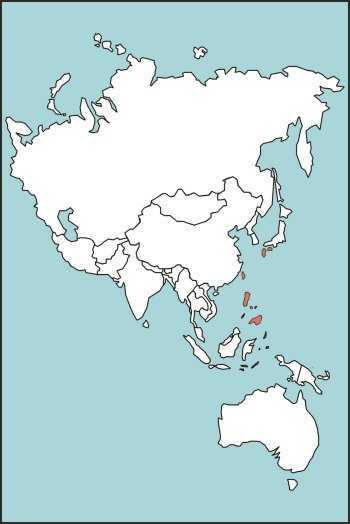 Distribution: Okinawa and neighboring islands and Kyushu (Figure E-29). 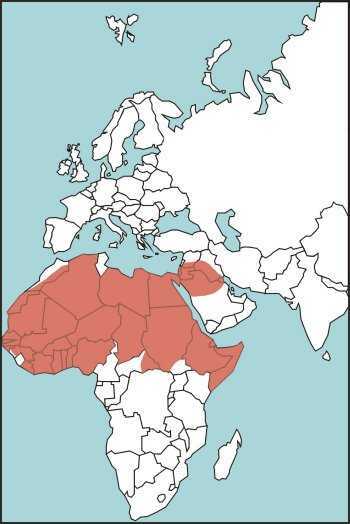 Distribution: Most of northern Africa and the Mideast (Figure E-30). Characteristics: Although it is the largest venomous snake in the world and it has a disposition to go with this honor, it causes relatively few bites on humans. It appears to have a degree of intelligence. 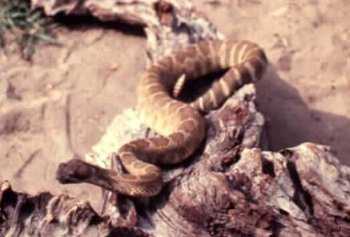 It avoids attacking another venomous snake for fear of being bitten. It feeds exclusively on harmless species. 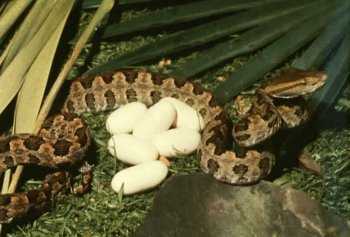 The female builds a nest then deposits her eggs. Lying close by, she guards the nest and is highly aggressive toward anything that closely approaches the nest. The venom is a powerful neurotoxin. Without medical aid, death is certain for its victims. Length: Average 3.5 meters (12 feet), maximum 5.5 meters (18 feet). Distribution: South and southeast Asia, particularly Thailand, southern China, Malaysia Peninsula, and the Philippines (Figure E-31). 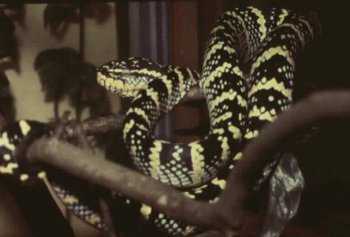 Characteristics: Kraits are found only in Asia. This snake is of special concern to man. 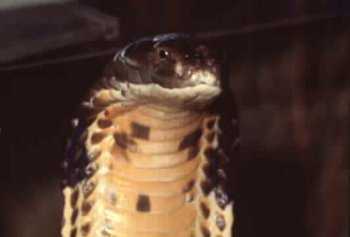 It is deadly—about 15 times more deadly than the common cobra. It is active at night and relatively passive during the day. The native people often step on kraits while walking through their habitats. The krait has a tendency to seek shelter in sleeping bags, boots, and tents. Its venom is a powerful neurotoxin that causes respiratory failure. Length: Average 90 centimeters (35 inches), maximum 1.5 meters (5 feet). Distribution: Much of south and southeast Asia, particularly India, Sri Lanka, and Pakistan (Figure E-32). 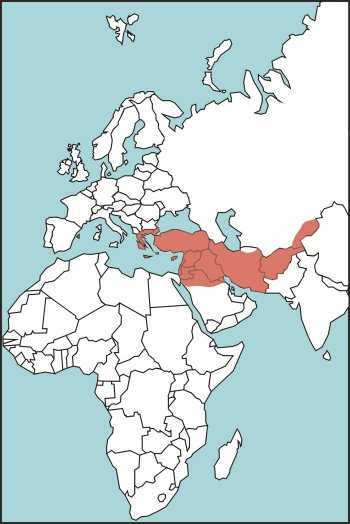 Distribution: Much of Asia Minor and southwest Asia, particularly Greece, Iraq, Syria, Lebanon, Turkey, Afghanistan, lower portion of the former USSR, and Saudi Arabia (Figure E-33). Distribution: Thailand, Laos, Cambodia, Java, Sumatra, Malaysia, Vietnam, Myanmar, and China (Figure E-34). 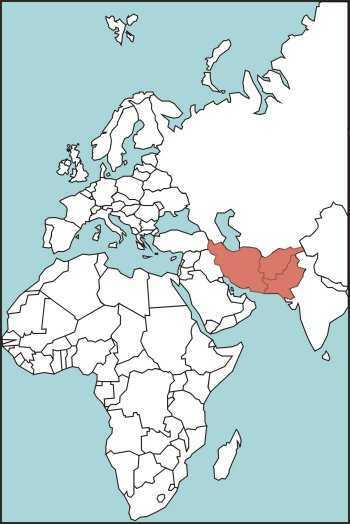 Distribution: West Pakistan, Iran, and Afghanistan (Figure E-35). 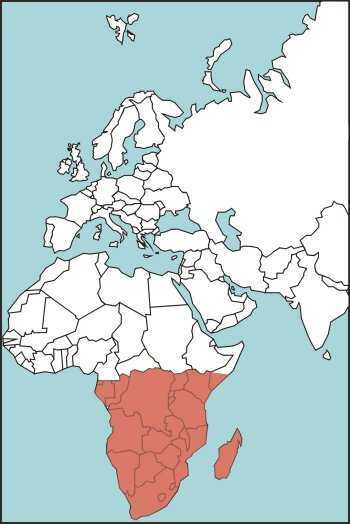 Distribution: Most of sub-Saharan Africa (Figure E-36). Distribution: Turkey, Syria, Palestine, Israel, Lebanon, and Jordan (Figure E-37). 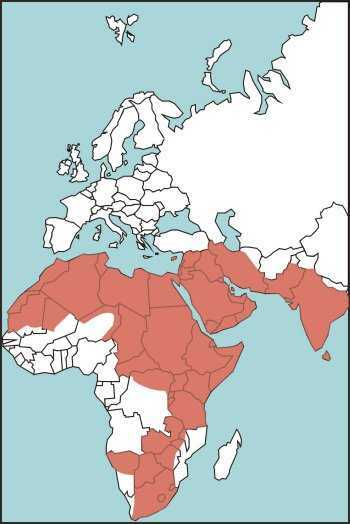 Distribution: Most of Africa, Saudi Arabia, and neighboring countries of southwest Asia (Figure E-38). 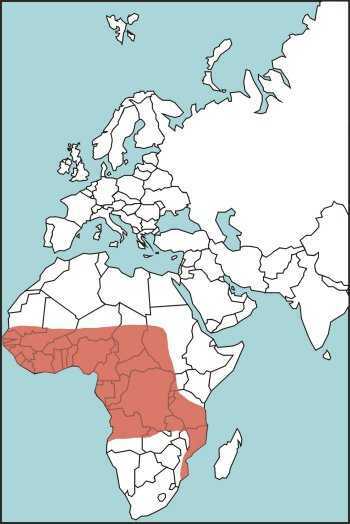 Distribution: Equatorial Africa (Figure E-39). Distribution: Much of south and southeast Asia, particularly Sri Lanka, south China, India, Malaysian Peninsula, Java, Sumatra, Borneo, and surrounding islands (Figure E-40). Description: Usually uniformly very pallid, with three rows of darker brown spots. 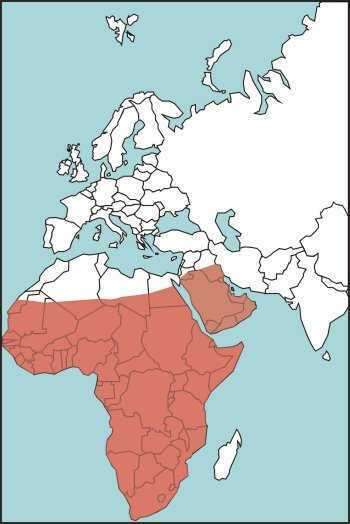 Distribution: Most of northern Africa and southwest Asia (Figure E-41). 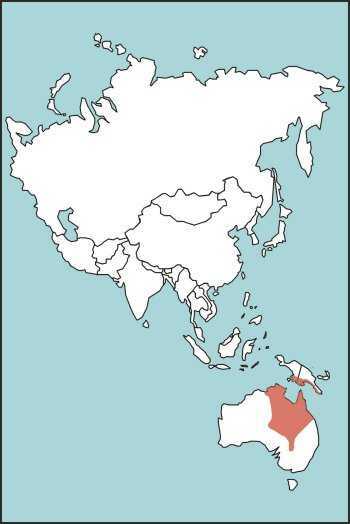 Distribution: Asia and Africa, including Syria, India, Iraq, Iran, Saudi Arabia, Pakistan, Jordan, Lebanon, Sri Lanka, Algeria, Egypt, and Israel (Figure E-42). Distribution: Malaysian Peninsula and Archipelago, Indonesia, Borneo, the Philippines, and Ryukyu Islands (Figure E-43). Distribution: Tasmania, South Australia, Queensland, and Kangaroo Island (Figure E-44). 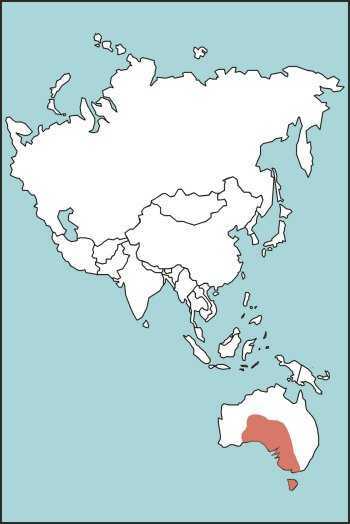 Distribution: Australia, New Guinea, and Moluccas (Figure E-45). Distribution: Northern Australia and southern New Guinea (Figure E-46). Distribution: Australia, Tasmania, Bass Strait islands, and New Guinea (Figure E-47). 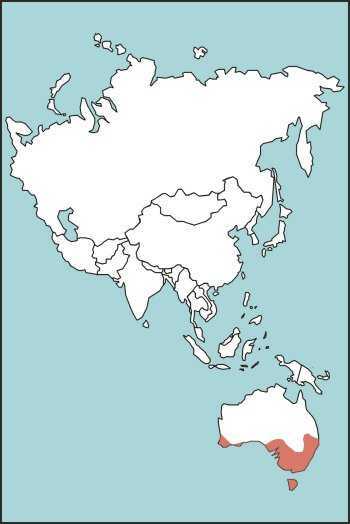 Distribution: Pacific Ocean coastal waters of Australia and southeast Asia; Indian Ocean coastal waters. (Figure E-48). Characteristics: A highly venomous snake belonging to the cobra family. This snake is truly of the pelagic species—it never leaves the water to come to shore. It has an oarlike tail to aid its swimming. This species is quick to defend itself. Sea snakes do not really strike, but deliberately turn and bite if molested. 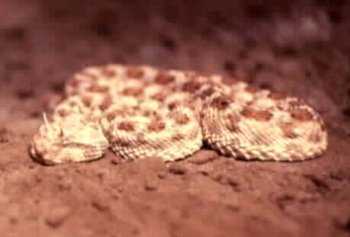 A small amount of their neurotoxic venom can cause death. 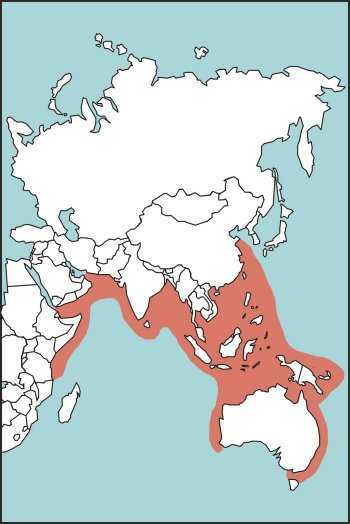 Distribution: Throughout the Pacific Ocean from many of the Pacific islands to Hawaii and to the coast of Central and South America (Figure E-49). Characteristics: Not an aggressive lizard, but ready to defend itself when provoked. If approached too closely, it will turn toward the intruder with its mouth open. If it bites, it hangs on tenaciously and must be pried off. Its venom glands and grooved teeth are on its bottom jaw. Length: Average 30 centimeters (12 inches), maximum 50 centimeters (20 inches). Distribution: Arizona, New Mexico, Utah, Nevada, northern Mexico, and extreme corner of southeast California (Figure E-50). 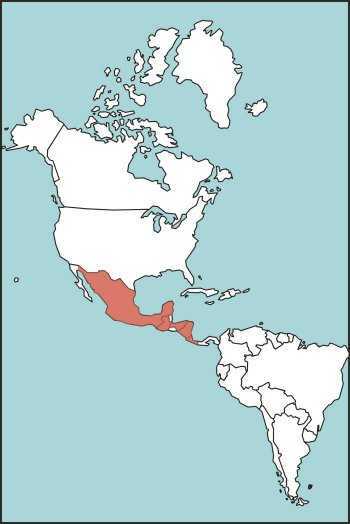 Distribution: Mexico through Central America (Figure E-51).